Hello, sorry if this isn't the place to report bugs and problems, I'm happy to move this once shown where to put it. I downloaded the trial of The Archive today, and wow, it's the most exciting development in plain text notetaking I've ever seen! I created a Keyboard Maestro string to enter the current date and time (ddtt = 201804232030), but whenever I enter this string to a new note title, the app quits. Every. time. Very frustrating! Does anyone know why this might be happening? This place is fine, thanks for reporting the issue! Can you share the keyboard maestro snippet completely? If the app crashes and not just quits, please email me the crash report from Console.app. "The Archive quit unexpectedly. Click Reopen to open the application again. Click Report to see more detailed information and send a report to Apple." Sharing macros as images allows people to see right away what your macro is doing, without requiring them to install anything. This is why you should always share (at least) an image. @Basil, thank you for the detailed instructions, I will do my best to follow them and supply the most helpful data. 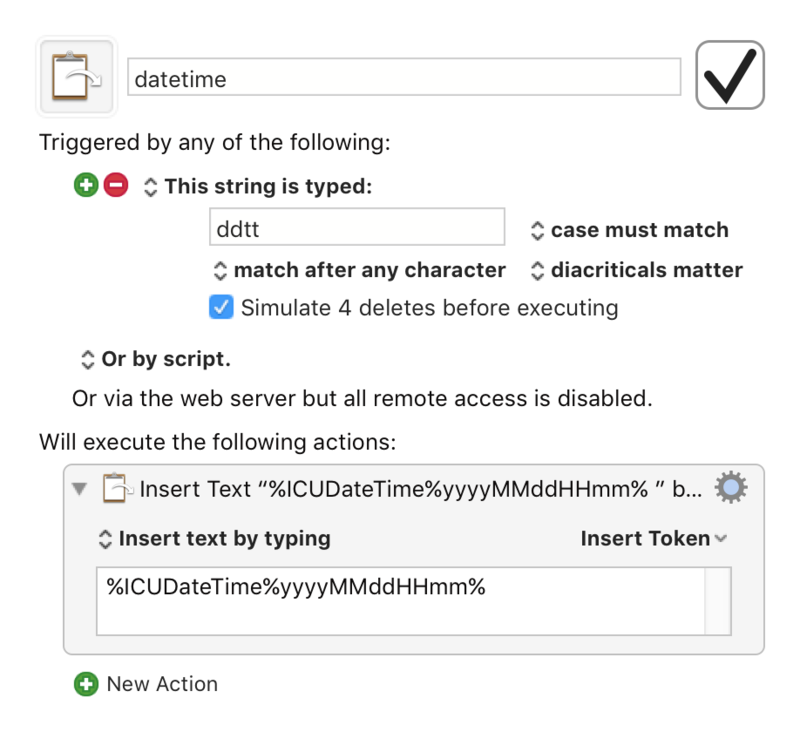 Note that the strings for either date or time on their own (ddd or ttt - see attached images) do not cause the app to quit. I have attached zip files of the .kmmacros that cause the app to quit, as well as images of those macros. Great work @Basil, thank you for explaining I'll keep this post handy for later. @miscellane: The macros look innocent enough to me. Please email me the full crash logs from within Console.app (you can use Spotlight to launch it) that is located below the "User Reports" group to the left. File names should start with "thearchive" or similar. No problem @ctietze, email sent. For posterity, here's the issue: on macOS 10.11, quick typing in the Omnibar can update the text editor too quickly for markup to catch up. This produces a crash. 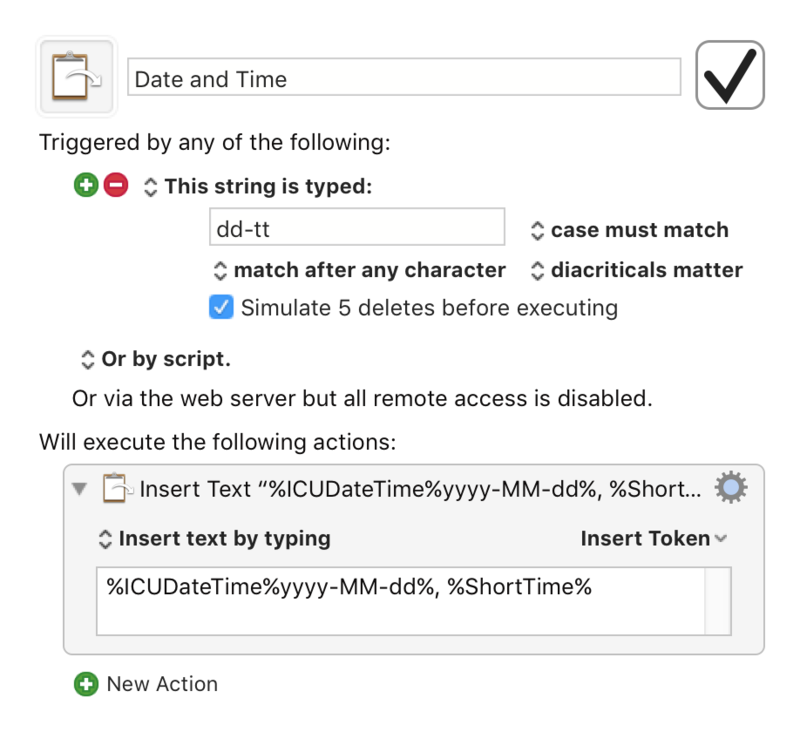 In the case of Keyboard Maestro macros, it can help to change the result from "Insert by Typing" to "Insert by Pasting" to avoid triggering 1 search request and editor update per typed character in quick succession. Unfortunately The Archive is not usable for me at this stage, hopefully it will be after @ctietze is able to implement a fix for the fast typing issue. I do type fast and wish to be able to continue doing so, however the app is crashing on me almost every time I type quickly at the moment. I'll keep an eye on things and look forward to the improvements to come. I think you should include "delays" on macros to avoid crashes.